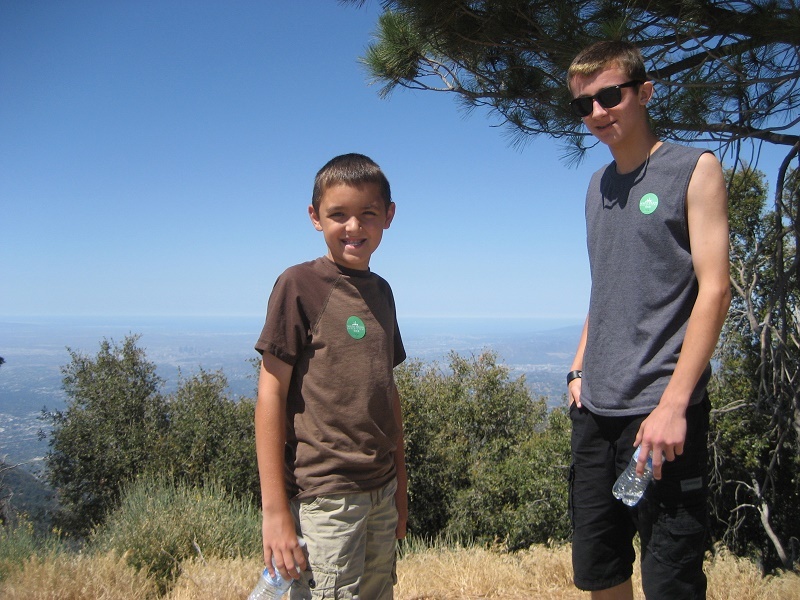 Sunday July 6 I was able to take a trip up to Mount Wilson Observatory with my mon and my little brother. In a sentence, It is a spectacular place to visit. There is a rich amount of history with a multitude of places to see and things to do! And a LOT of walking! It’s a really nice, but lengthy drive up in the mountains to get there, and the road is full of sharp turns. The whole way up I was trying to picture someone driving that big 60″ and that big big 100″ mirror up the very same road. Anyway we got to go on a tour of the whole place, or you can just walk around. I highly recommend the tour, but only on weekends, where they include visiting the observing floor of the 100″ telescope. There are so many observatories there, I never did a count, but over 5 separate domes, not including another observatory under construction while we were there. 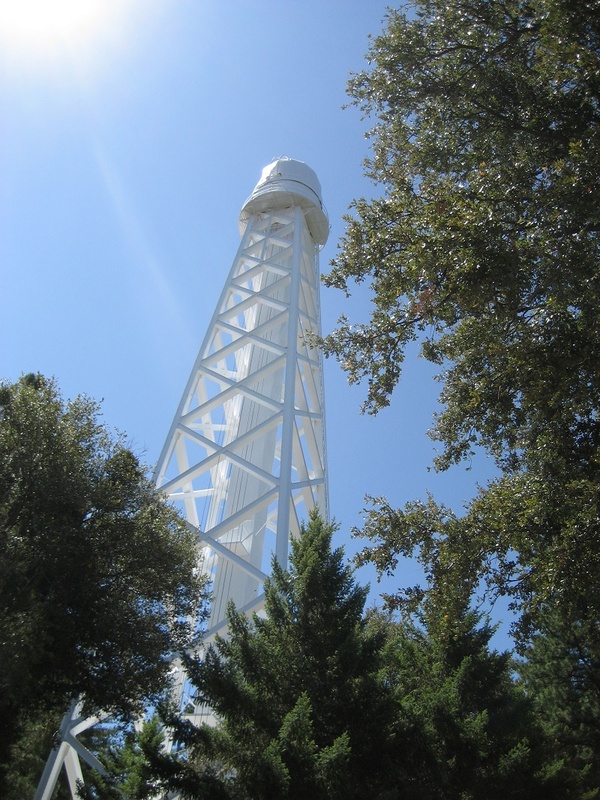 The first place we visited on the tour was the 150 foot solar telescope. This was pretty awesome, and it’s pretty darn hard to miss as well, as you could imagine, it’s a big tower. We were lucky enough to be accompanied one of the people that sketches the sun daily and he showed our tour group inside. Walking through the door was like walking right back into the good ol’ days of astronomy (not that I ever experienced them myself :D). Old equipment in use since it was first put into use since 1912. 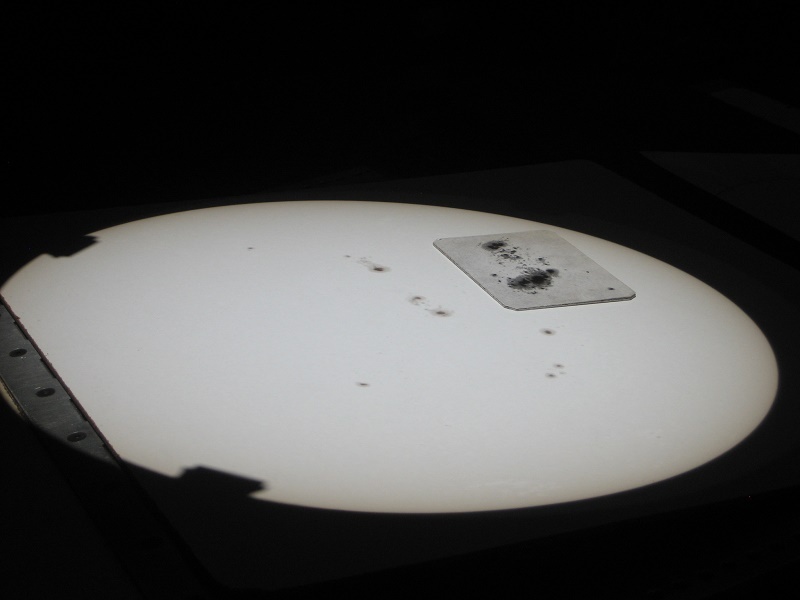 What was really exciting was the amount of sunspot activity, it was really active that day. There was a sketch of the biggest sunspot they ever recorded put down next to the live sunspots we were seeing, and they were that much smaller! Anyway, there was another small room with some really old computers, I have no idea what they were but they had the old reels like you see in the Apollo 13 movie! There is a live camera on the top of the tower that can be see here. 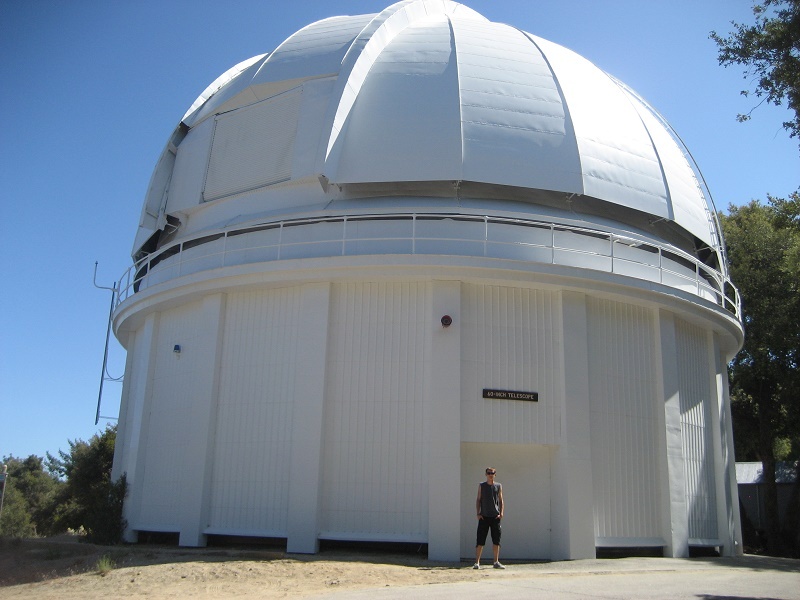 Next we got to check out the 100″ telescope. This is where it gets really interesting. This is a telescope that I’ve only seen in photos, and even the photos I’ve taken don’t come close to showing the sheer size and mass of it. Just up the road a little further from the 60″ dome lies the 100″ telescope across a bridge, a bridge where there is a plaque showing a photo of Albert Einstein standing on the bridge with a few other notable scientists. Standing in the spot where Einstein was, overlooking the huge dome. I’ve taken several photos of the inside of the observatory, but like I said, they don’t do it the justice it deserves. If your not taking the tour and just walking around, there is an area to the left of the observatory open to a small viewing area with some large windows looking into the observatory. 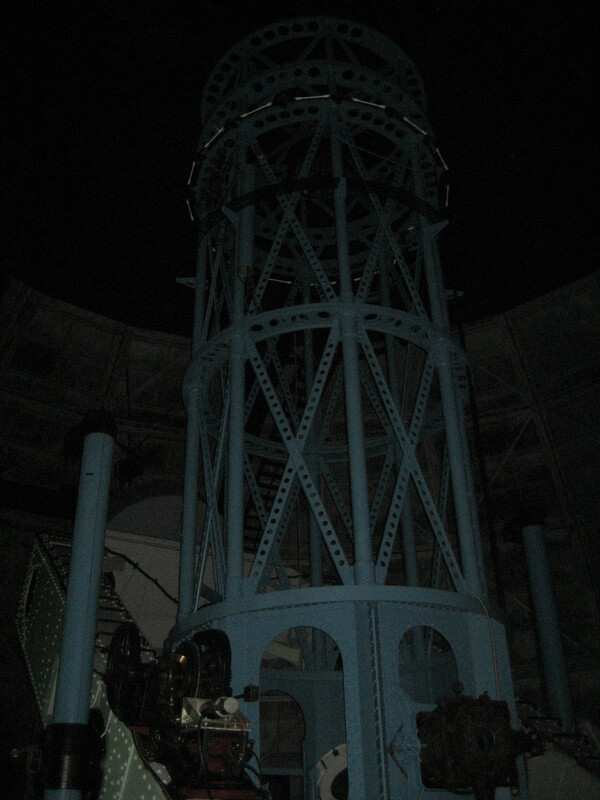 Before the tour began, we walked around and went into this room, and stared in awe at the telescope through the window. but being up close and personal with it is a whole different experience. On our tour, we get to go up a different way to the observing floor. Through the door pictured above in the background is what is like a large garage, there is even a garage door on the side! Then starts the stairs. And more stairs. And more stairs. 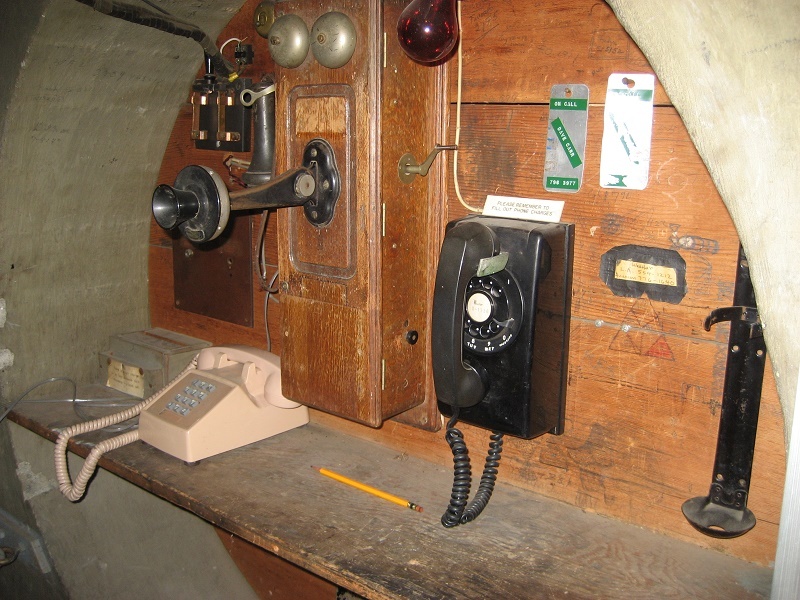 Up the first flight is a small area with a phone booth, showing different phones used throughout the time of the observatory. They just never got rid of anything! And now, the moment you’ve all been waiting for, we enter the observing floor of the 100 inch. Well, the first impressions are, as you might imagine, that it’s big!! It’s much bigger standing next to it than looking through a window. I remember reading about the silvering chamber under the floor where the mirror is pulled out for recoating every few months, and clear as day is this big circle where a very large and heavy mirror is lowered. We got to go upstairs onto the part where the dome rotates, and controls. Here’s some photos. This is the view from the floor. It is too big to fit in the photo. 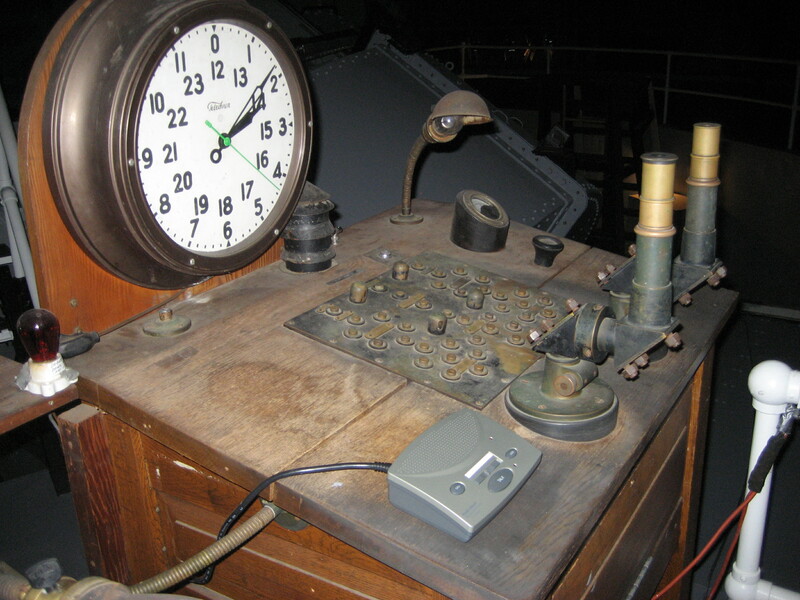 The original control board remains, it, and everything else in here is 97 years old. View from the upstairs on the rotating dome section. This next photo is pretty cool, because it shows up inside the mirror cell and looking at the primary mirror. The primary mirror is made of plate glass, and it one solid piece. It weighs 9000 pounds and is 12″ thick. 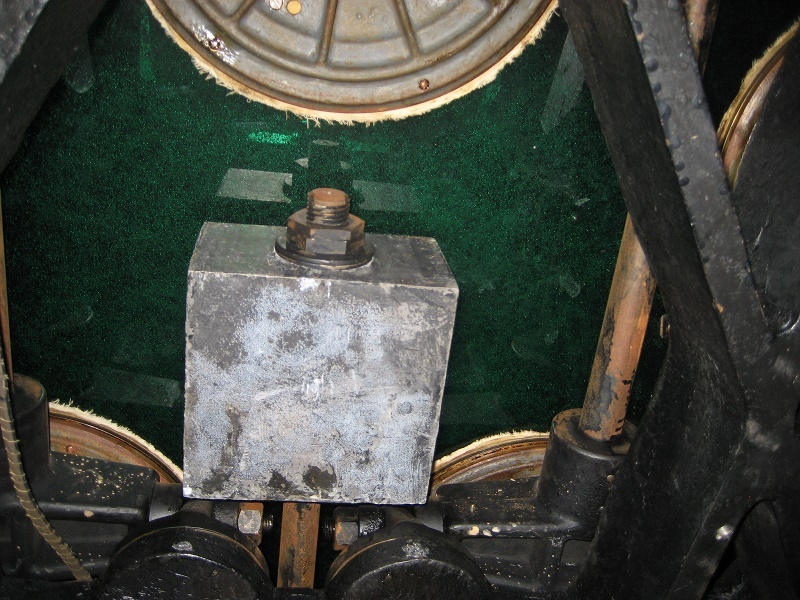 In the photo you can see the back side of the mirror (green) and you can see some of the pads that support it. Well, the last set of photos I have is a fairly recent modification for visual use that seats the eyepiece to a much more comfortable angle. 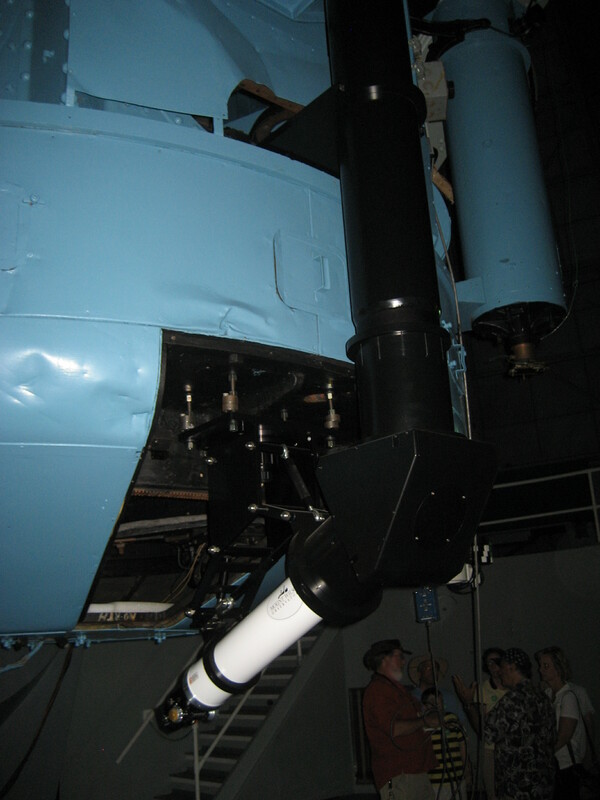 It appears that there has been a modification to shoot the light gathered from the 100 inch mirror down at the back of the telescope, by means of a huge prism and a refractor tube equipped with a 2″ Crayford focuser. I found that the tube is from an Explore Scientific refractor, and the focuser is an Astro Physics. 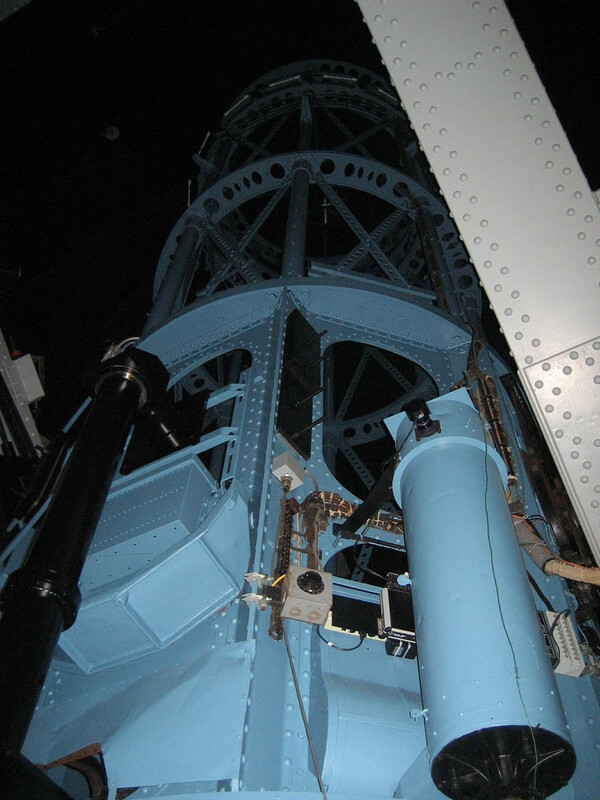 Here is a link to a great article on the history of this telescope. Link. That’s about all I’ve got for photos. After the observatory, we went out to a special viewing spot called Echo point, with a beautiful view of the entire area, we could easily see the ocean and Catalina Island and even San Clemente Island. All in all, it was an awesome trip, a lot of walking, and a lot of fun. I’d highly recommend taking a trip up to Mount Wilson, you won’t be disappointed. 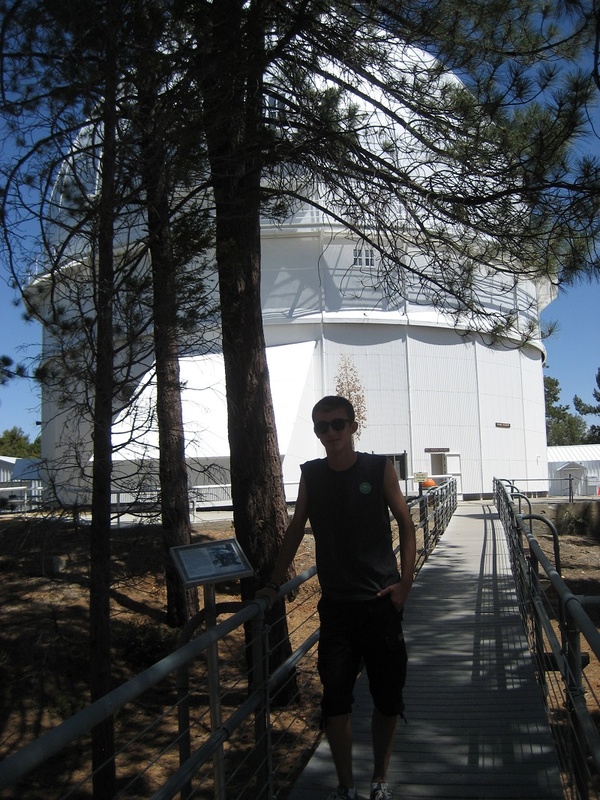 I’d love to go back soon and do some observing with their big telescopes!